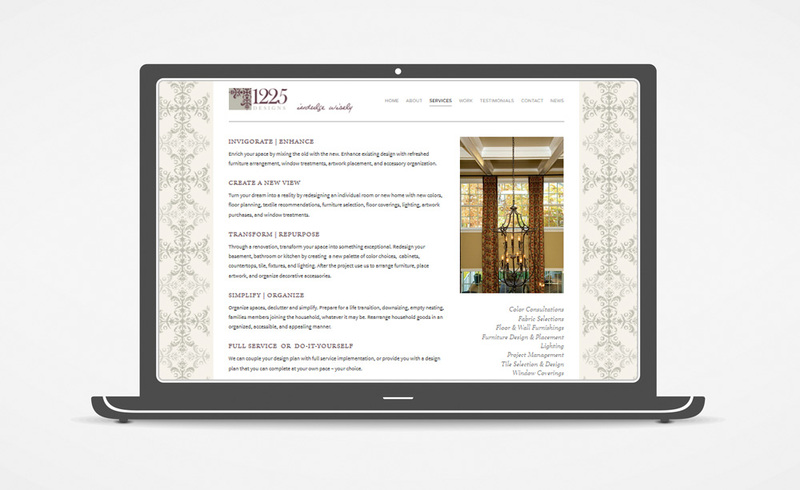 It was a pleasure to work with Katie Buck, a DC-area interior designer, to launch a new website for her firm 1225 Designs. We utilized her existing branding for a custom-designed background pattern and applied her color palette to a clean and contemporary layout for a fresh presentation of her work. Clients Pace Development Group and Shannon Joseph Interiors recently enjoyed the honor having a project chosen for the Dilworth Home Tour . The featured home was Shannon's own residence, built last year by Pace. The two companies served as co-sponsors in the popular home tour. For each of them, we created a simple, two-sided rack card to display at the home during the tour. 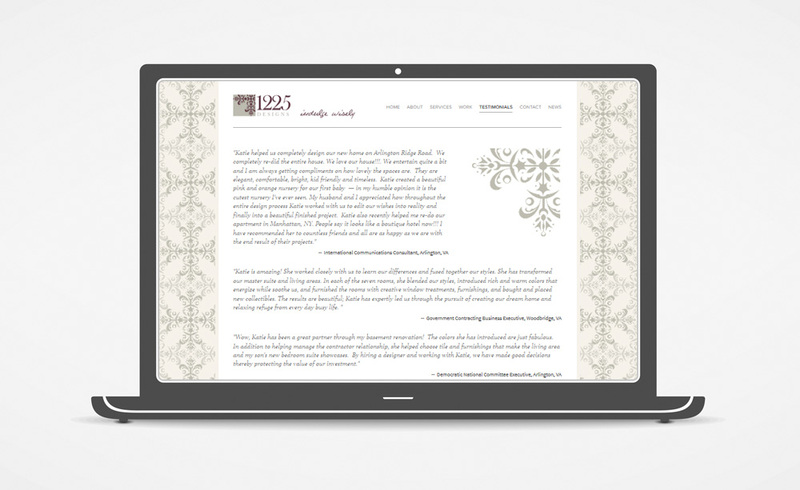 I recently completed a rebranding for Charlotte-area interior designer Wanda S. Horton. She was tired of the color scheme of her old logo and wanted to modernize the monogram graphics to more accurately reflect her style. I also helped Wanda with her creation of a new website. She is a technology-savvy entrepreneur and was able to do most of the work in setting up a new website on the Squarespace platform. I came in after she had already created most of her content to consult on information organization, provide some copy editing, and make some style changes to polish up her implementation of the already-great template she'd chosen, making sure her website design reflected her new branding. I am always so grateful to work with creative professionals, especially when they are good at what they do. Putting some polish on the branding efforts of a talented interior designer is fun work! I am pleased to share the new logo and website of interior designer Shannon Joseph -- a simple presentation of some great photography of some great design work. Check out her site at www.shannonjoseph.com to see her beautiful interiors. I am tickled with the beautiful sign erected this week at 708 East Boulevard. 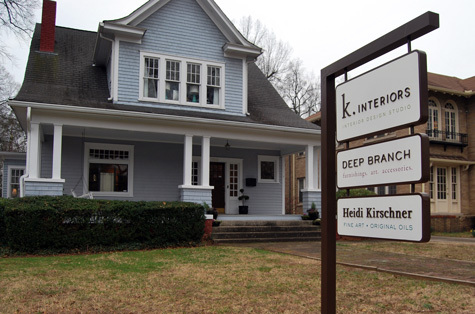 Clients K. Interiors, Deep Branch, and Heidi Kirschner have inhabited a new space in this old Dilworth house and we worked hard at the end of last year to design signage that would reflect their impeccable taste, clean aesthetic, and provide good visibility in their new high-traffic spot. We created a metal sign with modular elements that would allow them flexibility as they took on new residents. Primary letters are raised, with secondary lines printed, a solution that provided the drama of three-dimensional signage while allowing the flexiblity of providing additional information at a scale that wasn't cut out for diecut lettering. Printer/Manufacturer Pheonix Signs was terrific to work with and produced a beautiful sign that my cursory photos are not doing justice. 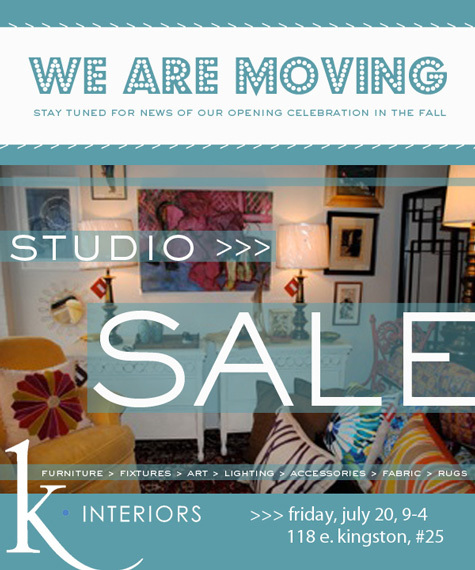 Interior Designer K. Interiors is moving to a beautiful new location next month and is selling off all their stuff to lucky shoppers next week. 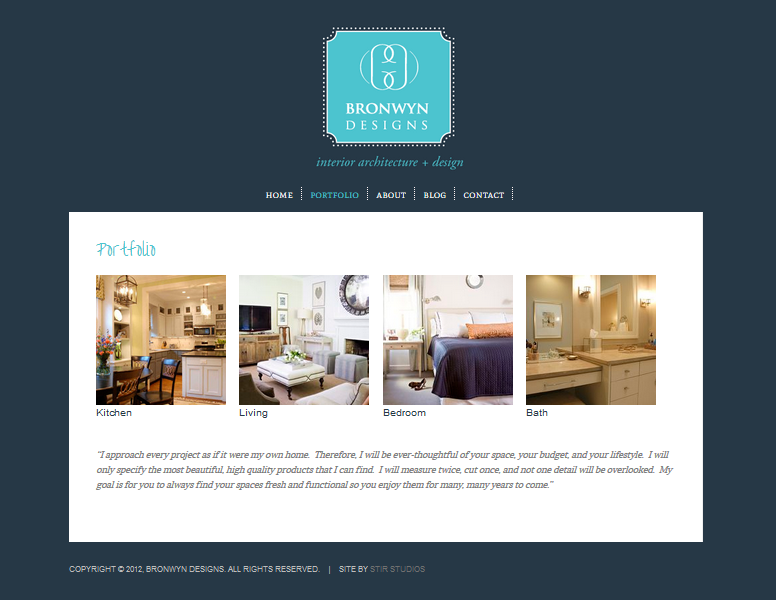 I am pleased to share the just-launched branding and website of Charlotte interior designer Bronwyn Ford. Her work is lovely and has been captured beautifully by Ashley Sellner Photography in this new portfolio and blog site. Congratulations and thanks, Bronwyn! After 14 years in business with the same business card and no website, interior designer Nancy Maloney was ready to update her marketing materials to reflect her professionalism and success. We freshened her logo with a new rendering by illustrator and architectural designer Michelle Sutton, and modernized the type selections and layout - all with the intention of honoring her original design. 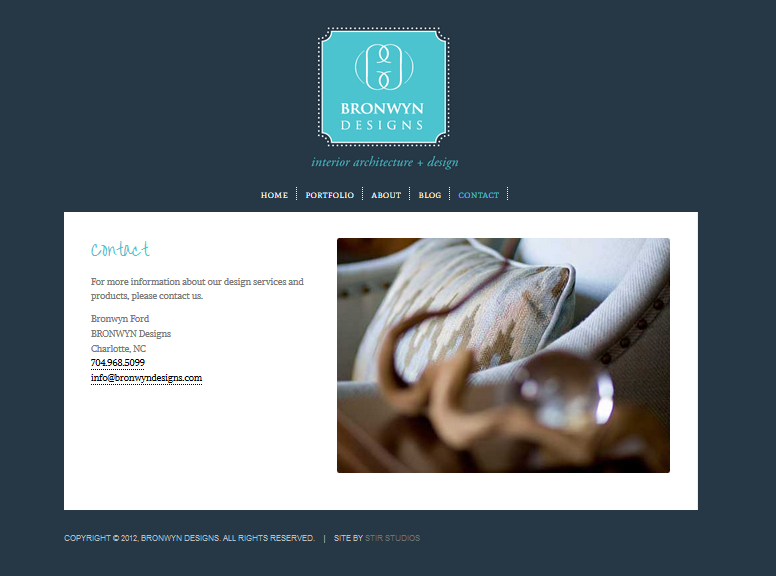 Using a swatch from a favorite wallcovering, we developed a pattern for use on the rear of her business card and as a background for her website. Her new cards were printed on extra-heavy linen cardstock with rounded corners and custom 3x3 sizing. AFTER: New Good Manors Business Card and LogoGood Manors' website features galleries of past projects, organized by room, as well as a blog that pairs before and after images with descriptions of projects. Photography Ashley Sellner provided some stunning images of Nancy and Lauren in the studio, as well as some great interior shots of recent jobs. This card was printed at 3.5"square on linen cardstock for use at an open house event. 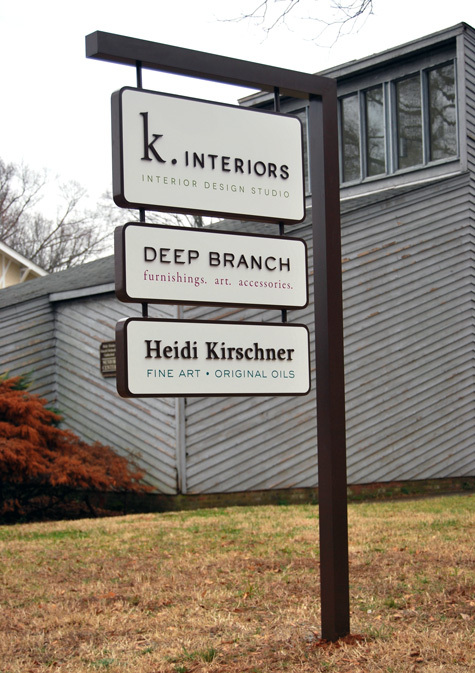 The designers of K. Interiors wished to have a card available to visitors as an alternative to a brochure or business card, something that included an image of their work and a reflection of their style. Kate Newman and Caitlyn Miller, the talented interior designers of K. Interiors, have done it again. They have again collected a beautiful collection of design finds for the most recent edition of their Delve Design Journal newsletter. This winter's Delve features more lovely photographs by Ashley Sellner sharing goodies including holiday decor ideas, art from Lita Gatlin, and beautiful fabrics and wallpapers.